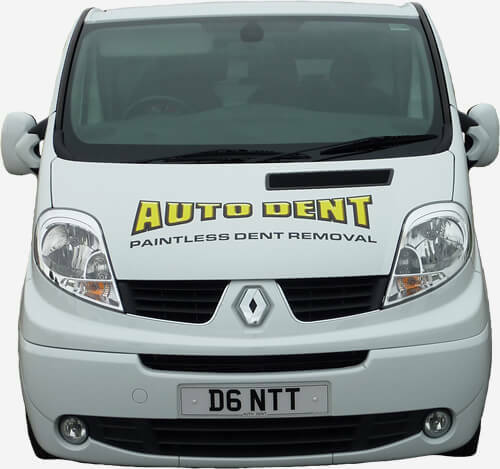 Covering Wakefield, Barnsley, Sheffield and surrounding areas, when you choose Auto Dent for your paintless dent removal, you choose excellent quality and customer service - every time. We're proud of our status as one of the very first independent dent repair companies in Yorkshire, and of the great reputation we've built over nearly two decades of operation. Bodywork expert Lee Broomhead has been in the trade for over 30 years, and specialising in professional paintless dent removal for nearly 20 of them. In this time, he's worked for many bodyshops, lease hire companies and main agent dealerships, repairing dents in everything from Ford Fiestas to prestige cars such as Ferraris, Porches and Bentleys. Now we find ourselves travelling all over the local area, delivering mobile dent removal services at highly competitive prices. Paintless dent repair is exactly what it sounds like - using special tools, we 'massage' the dent out from behind the bodywork, restoring the original shape without the need for filler or paint. Taking your car to a bodyshop or claiming for a repair on your insurance can be pretty costly - but our mobile dent removal service is competitively priced, for a more budget-friendly solution. Because we come to you (at home or work! ), you won't be without your wheels, and our experience and expertise means that most dents can be removed within an hour - or even less! That's right - because there's no need to fill or paint over the dent repair, your original bodywork remains intact, without the worry of colour-matching and an obvious repair site. What caused your car dent damage? If your dent was caused by any of the following, call us - we can help! A common car park occurrence and a frustrating one too - if someone's car door has been opened into yours leaving a dent, we can repair it quickly and effectively. Another form of car park damage, if a trolley has rolled into your car, we should be able to remove it - get in touch for shopping trolley dent removal. Our small dent removal service will smooth problems caused by a multitude of objects of many sizes and shapes, such as falling apples, conkers, fireworks and golf balls. Whether caused by bad wheelie bin 'steering' or heavy winds blowing an empty bin into your car, we can remove these wheelie big or wheelie small dents - call us! Dent damage can easily be caused by racks not being fitted correctly, coming loose due to a bump or even when fixing or removing them - contact us for roof dent removal. Becoming increasingly common, heavy hail stones can easily dent and damage your car's bodywork - we're experts at fixing hail stone dents, and at highly competitive prices! Lee did an absolutely amazing job! He came to my office and repaired a dent in my Mercedes SLK door at a fraction of the price my local bodyshop quoted, I can strongly recommend Auto Dent. I honestly did not think the damage on my Jaguar XF roof was repairable, but on Auto Dents arrival and 90 minutes later it was gone - Quality work at a very reasonable price. Fantastic service and superior results. As always, Lee did such a fantastic job on my 6 month old Ford Focus which had mysteriously acquired 2 dents in the middle of the bonnet (my 3rd car Lee has worked on). Auto Dent did a great job removing the dents in my BMW 2 series, I could not be happier with the service and the quality of his work is incredible. Lee did an incredible job on my new Mini Copper, very professional, excellent service with great results. At Auto Dent, we strive for the best possible service at affordable and competitive prices. With almost 20 years of carrying out paintless dent removal services, you can be confident that your vehicle is in the safest of safe hands. family cars to high performance and luxury cars, we can cater for all. We can repair dents in any vehicle make and model.